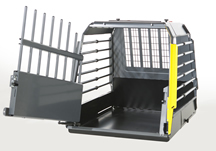 Prices include: delivery of flatpacked crate to any UK mainland address (or you can collect from one of our showrooms or fitting centres listed below); escape hatch; keys to lock the cage; straps to secure crate to cargo points in vehicle; divider (double crates only). Although the manufacturer has stopped supplying rubber mats with the crates we plan to offer these still . We take payment by card either over the telephone for flatpacked crates or in person at shows or at any of the showrooms. The cages have been crash tested, they're made of galvanised steel (with the exception of the Minimax) and extend to suit the length of your vehicle (very useful as you can change the length to suit different vehicles). 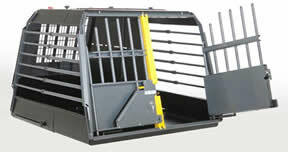 Dividers are supplied with double cages but you can choose not to use them. New prices announced 17th April 2019. See prices page for further information. For flatpacked cages & fittings in Westerham, Kent, call 020 8658 0002. Prices will be confirmed when appointments are booked.